Violet Town is 150 km north-east of Melbourne, between Euroa and Benalla. It is on the Melbourne to Wodonga railway and is bypassed by the Hume Freeway. The town is situated on Honeysuckle Creek, originally described as Violet Ponds by the New South Wales Surveyor General, Thomas Mitchell, in 1836. Three years later the Sydney authorities chose that location for a township on the Sydney to Port Phillip track. Naming the place Violet Town, survey draftspeople gave floral names to the streets, perhaps humorously. Despite official unease, the names stuck: Cowslip, Hyacinth, Tulip etc. Coming first did not ensure Violet Town staying ahead of Euroa and Benalla. It gained some trade from travellers to the Ovens goldfields in the 1850s, but farm selectors who settled around Violet Town from the 1870s onwards did not draw big incomes. The town’s population was 386 in 1891. Until 1895 Violet Town was in Euroa shire. The shire council was heavily in debt and wet weather road maintenance was a further burden on its resources. 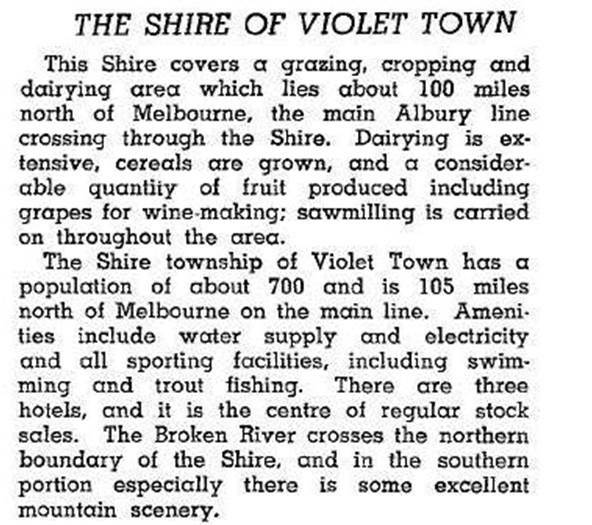 For about ten years Violet Town had been unhappy with Euroa’s municipal government, and there had been a steady growth in farm settler numbers in the villages north of Violet Town, towards the Broken River. 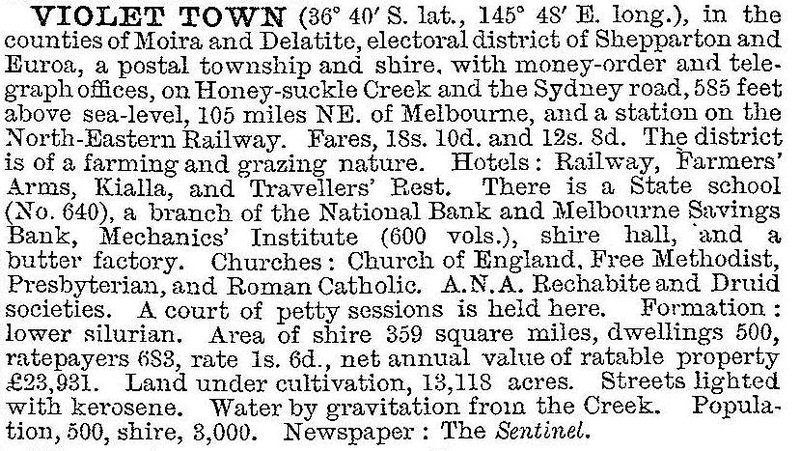 Severances from Euroa and Benalla shires were joined together on 11 April 1895 to form Violet Town shire, an area of 935 sq km. The shire’s transport corridor was the Melbourne-Wodonga Road, closely paralleled by the railway. To the north there were small villages on undulating to flat terrain, to the south there were fewer villages in the foothills of the Strathbogie Ranges. The outlying areas experienced population declines in the twentieth century. Rabbit infestation in the ranges was ruinous even though it put meat on the table. Violet Town’s population also fell away, not recovering until postwar prosperity brought new people in the 1950s. A swimming pool was built a few years after centenary celebrations in 1949, but the idea of a new civic centre in the 1960s met with ratepayers’ resistance. They relented in the next decade, which coincided with the shire slowly rising from the bottom of its population curve. The bush nursing hospital was replaced with a nursing home (1985) and the Hume Freeway bypass was viewed as a loss. The bypass certainly meant the closure of the RACV depot, but it also made Violet Town residentially more attractive. In fact population steadily increased, continuing into the next century. Violet Town has an attractive main street, uncongested by through traffic. There are a hospital, Anglican, Catholic and Uniting churches, a memorial hall, a caravan park, a State primary school (a campus of the Peranbin primary college), golf, bowls and swimming venues and a large public reserve along Honeysuckle Creek. In 1994 the shire had 155,000 sheep and lambs and 12,000 meat cattle. Municipal amalgamations in 1994 saw Violet Town shire divided two ways: most went to Strathbogie shire, being joined with most of Euroa and Goulburn shires and parts of McIvor shire and Seymour rural city. The balance went to Delatite shire. Violet Town shire was six months short of its century. In 2014 the community delivered it's third Violet Town and District Community Plan 2014-18. The town has an active and involved Violet Town Action Group to improve the town's amenity.